Rice feeds more than half the population on earth and comes in many varieties. These range from the typical "American Long Grain" and similar varieties to the specialist sticky and black varieties found in some oriental markets. I am constantly being asked how I get my rice to remain separate when cooked and here I attempt to pass on some of the secrets. The recipes given here are intended for common rice types suitable for boiling and general use such as Basmati and American Long Grain. Special types such as pudding, Thai and risotto will not give good results. Different varieties of rice absorb different amounts of water when cooking. sometimes it is necessary to experiment with the variety that you use to get the correct quantities, particularly when the "exact water" methods, e.g. steamed and microwave, are used. The quantities shown below are for Basmati rice which is an average, typical variety. Different varieties may need slightly more or less water when steamed or microwaved. The quantities shown in the recipes are typical for a family. If you need to prepare larger quantities BEWARE, cooking times do not vary proportionately. In addition, rice does not lend itself to being prepared in very large quantities at once. Twice the amounts shown is about the limit. It is better to prepare several small batches than one very large one. See the notes for the individual recipe. Cooking times can vary with ALTITUDE! Yes, it is true, the higher up you are, the longer it can take! This is because the boiling point of water drops as you go higher. This should not affect most cooks but it has to be said. Timing can be crucial, particularly when preparing plain boiled rice. Don't be afraid to test at regular intervals when boiling but NEVER open the pot early when steaming or microwaving! Small amounts of other ingredients, e.g. whole spices such as cloves or cinnamon, will not affect cooking times substantially but using stock in place of water probably will extend the time required for the rice to cook. We prefer to measure rice by volume as it is easy. 15 fl oz or 425ml weighs approximately 360g (12oz). We wash and soak the rice before cooking. This reduces the cooking time and helps separate the grains. Do not over wash or soak risotto, Thai or similar types as these are intended to be sticky. Use at least 3, preferably 4 or more pints of fresh water in a large saucepan and 2 teaspoons (10ml) of salt. Make sure that the saucepan has at least 3cm (1.25") above the water to allow for boiling. 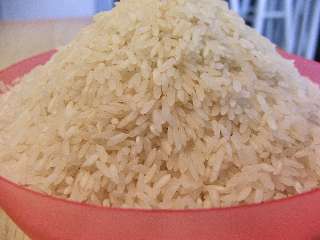 Rinse and wash the rice thoroughly in a sieve and place in a bowl to soak in 2 pints of water for 20 - 25 minutes. Do not soak for too long as the rice will cook too quickly. Bring the water and salt in the saucepan to the boil. Drain the soaked rice thoroughly in a sieve and carefully add to the boiling water. Keep the pan on a high heat until the rice is boiling again. During this time you can cover the pan but remove the cover as soon as the mixture is boiling again. Keep the boiling fairly vigorous. Check the rice after about 4 minutes using a teaspoon to "fish" for a few grains. If the rice is cooked, there will be no hard centre in the grains. keep boiling until cooked then drain immediately through a sieve or colander with small holes. Allow all the water to run away. Serve hot straight away. Make a note of the cooking time and rice type for future reference. Most of the salt is drained away with this method so you may need to adjust the quantity used to suit your taste. To prepare larger quantities, increase the salt and cooking water volume proportionately but the cooking time will remain almost the same if the boiling is kept vigorous enough- check regularly! Use a heavy pan with a very close fitting lid. We use a fairly large cast iron casserole. The rice is effectively being steamed so leaks should be prevented. Make sure that the pan has at least 5cm (2") above the water to allow for steam. Exact quantities are important in this method. Bring the water and salt in the pan to the boil. Drain the soaked rice thoroughly in a sieve and carefully add to the boiling water. Keep the pan on a high heat until the rice is boiling again. Immediately the mixture is boiling properly again, cover and reduce the heat to an absolute minimum. Cook at this heat for 20 minutes then turn off the heat. Note that gas and induction cookers lose heat quickly, Aga and old fashioned electric cooker rings retain heat and so you may need to remove the pan from the cooker. Allow the pan to stand, covered and undisturbed for 5 - 10 minutes. Remove the lid and toss the rice gently using two forks so as to "fluff" it up. Serve hot straight away. If prepared in advance, replace the lid, the rice should stay reasonably hot for up to half an hour. None of the salt is drained away with this method so do not add too much. To prepare larger quantities, increase the salt and cooking water volume proportionately but the cooking time will extend. Twice the amount of rice should cook for 25 - 30 minutes before being allowed to stand. Use a microwave proof bowl with a small steam vent or cover the bowl with cling film and pierce once to make a small vent. We use a fairly large glass bowl. The rice is being steamed so only a small vent should be used. Make sure that the bowl has at least 2.5cm (1") above the water to allow for steam. Exact quantities are important in this method. Remove the bowl from the microwave and allow to stand, covered and undisturbed for 5 minutes. Remove the cover and toss the rice gently using two forks so as to "fluff" it up. Serve hot straight away. If prepared in advance, replace the cover, the rice should stay reasonably hot for up to half an hour. To prepare larger quantities, increase the salt and cooking water volume proportionately but the cooking time will extend. Twice the amount of rice should cook for 10 minutes + rest 5 minutes + cook 10 minutes at 800w before being allowed to stand.